Your dog is allowed at Rossmore. The holiday cottage of "Rossmore" can be found in Holme-next-the-Sea in Norfolk. Sleeping 8 people in 4 bedrooms. The bedrooms are made up of: Bedroom 2- Lovely room with double bed, ample storage and windows to the front of the property, access to family bathroom; Bedroom 3- A good sized room with two single beds, wardrobe and bedside tables with lamps; Bedroom 4- Single bed + bunk bed with ladder, TV, views over the garden. As Rossmore sleeps 8 people, it is perfectly sized for a family holiday. These are the reviews for Rossmore. There are 4 reviews. Weekend break. Lovely spacious comfortable house with a well equipped kitchen. Perfect for family gathering. Lovely location. 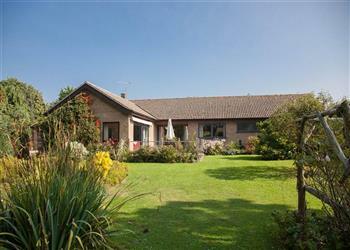 We chose a week in which we had a bad weather but Rossmore is big enough and a comfortable family home. We had a great time. We have stayed before and hope to stay again someday. Very nice property & location Had every think we need & more we would book again. The local pub was excellent & great food. back again, all what we expected at very short notice due to health reasons. good location and short distance from our holiday requirements. Beaches and bird watching. Will be returning end of April - Third time within 12 months! If you're looking for other cottages around Rossmore, we've got some cottages below which may take your liking. There are 221 cottages within 5 miles of Rossmore - and they have reviews too.